Spend more time ENJOYING your fountain and less time CLEANING it! 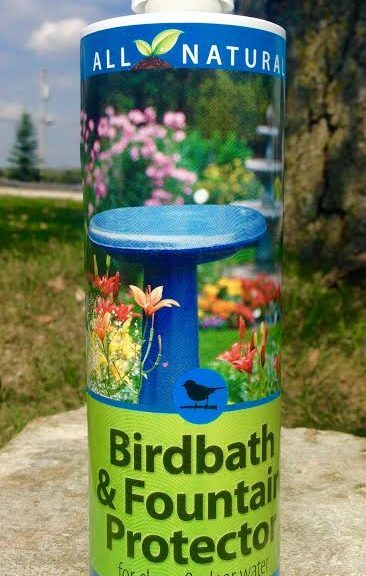 Birdbath & Fountain Protector contains natural enzymes. It safely breaks down organic contaminants such as: sludge, water lines and organic stains caused by birds and the environment. Our product is safe for birds, pets and wildlife. The formulated ingredients of all-natural enzymes can safely be used on fountains and birdbaths that are ceramic, stone, or plastic. Our Enzymes enhance the performance of all indigenous bacteria (good bacteria naturally found in fountains) which maintain healthy and natural water conditions; meaning, less future upkeep is required while using our product. Eliminate sludge, ammonia, cloudy water and prevent mineral deposits from forming. Keep your fountain, pumps, and water lines free from organic buildup, allowing them to look and work their best.